An esteemed army officer in the ancient Roman Republic, Horatius Cocles lived in a legendary period of Rome during the late sixth century. 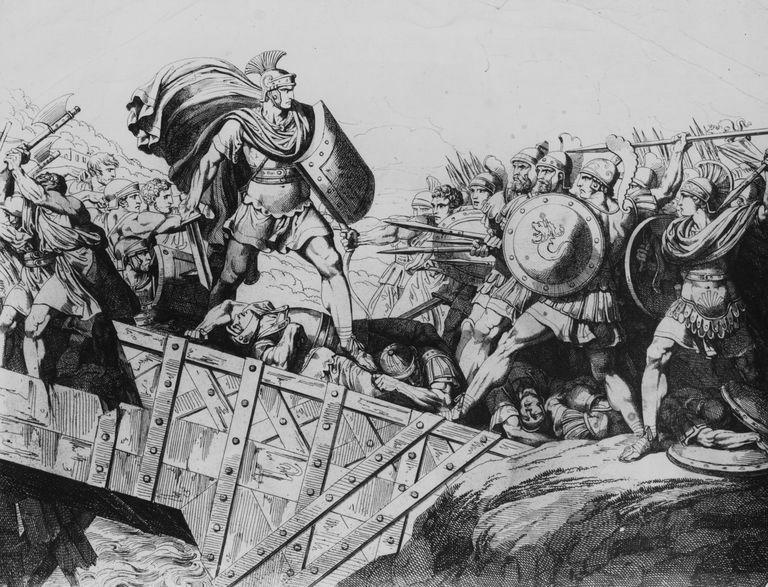 Horatius was known for defending one of Rome's most famous bridges, the Pons Sublicius, during the war between Rome and Clusium. The heroic leader was known for fighting against Etruscan invaders such as Lars Porsena and his invading army. Horatius was known as a courageous and brave leader of the Roman army. The poet Thomas Babington McAulay is also known as a politician, essayist, and historian. Born in England in 1800, he wrote one of his first poems at the age of eight called "The Battle of Cheviot." Macaulay went on to college where he began to have his essays published prior to a career in politics. He was best known for his work in History of England covering the period 1688–1702. Macaulay died in 1859 in London. The story of Horatius is described in Plutarch's "Life of Publicola." In the early 6th century BCE, Lars Porsena was the most powerful king in Etruscan Italy, who Tarquinius Superbus asked to help him take back Rome. Porsena sent a message to Rome saying they should receive Tarquin as their king, and when the Romans refused, he declared war on them. Publicola was the consul of Rome, and he and Lucretius defended Rome until they fell in battle. Horatius Cocles ("Cyclops," so named because he had lost one of his eyes in the wars) was the keeper of the Gate of Rome. He stood in front of the bridge and held off the Etruscans until the Romans could put the bridge out of commission. Once that was accomplished, Horatius, wounded by a spear to his buttocks and in full armor, dove into the water and swam back to Rome. Horatius was forced to retire as a result of his injuries and, after a protracted siege of the city, Lars Porsena captured Rome, but without sacking it. Tarquinius Superbus was to be the last of the kings of Rome. The following poem by Thomas Babington Macaulay is a memorable ballad that recounts the courage of Horatius Cocles in his battle with the Roman army against the Etruscans. And tower and town and cottage have heard the trumpet's blast. "Go forth, go forth, Lars Porsena! Go forth, beloved of Heaven! And hang round Nurscia's altars the golden shields of Rome." For since Janiculum is lost, naught else can save the town..."
"To arms! To arms, Sir Consul! Lars Porsena is here!" Is heard the trumpet's war-note proud, the trampling and the hum. And if they once might win the bridge, what hope to save the town?" "Hew down the bridge, Sir Consul, with all the speed ye may! "Lo, I will stand at thy right hand and keep the bridge with thee." "I will abide on thy left side, and keep the bridge with thee." "Horatius," quoth the Consul, "as thou sayest, so let it be." Rolled slowly towards the bridge's head where stood the dauntless Three. The fortress of Naquinum lowers o'er the pale waves of Nar. And the proud Umbrian's golden arms clashed in the bloody dust. And wasted fields, and slaughtered men, along Albinia's shore. From Ostia's walls the crowd shall mark the track of thy destroying bark. But will ye dare to follow, if Astur clears the way?" Then, like a wild-cat mad with wounds, sprang right at Astur's face. The good sword stood a hand-breadth out behind the Tuscan's head. "And see," he cried, "the welcome, fair guests, that waits you here! What noble Lucumo comes next to taste our Roman cheer?" For all Etruria's noblest were round the fatal place. "Now welcome, welcome, Sextus! Now welcome to thy home! Why dost thou stay, and turn away? Here lies the road to Rome." "Come back, come back, Horatius!" loud cried the Fathers all. "Back, Lartius! Back, Herminius! Back, ere the ruin fall!" "Down with him!" cried false Sextus, with a smile on his pale face. "Now yield thee", cried Lars Porsena, "now yield thee to our grace!" A Roman's life, a Roman's arms, take thou in charge this day!" "Curse on him!" quoth false Sextus, "will not the villain drown? But for this stay, ere close of day, we would have sacked the town!" For such a gallant feat of arms was never seen before."